Are your windows in bad shape? Are you thinking of replacing them, but don’t have the means to do so now? There is an impression among homeowners in Chesterfield that a window replacement can be an expensive project. That might be the reason why some people decide to rather or postpone calling a contractor or just put up with their dilapidated windows. Unfortunately, doing so can only cost you more in terms of energy efficiency and comfort. Old windows may leak out more air and cause temperatures indoors to soar. Moreover, the air leakage causes your cooling systems to work twice as hard to keep the home comfortable. This will of course increase your power consumption, leading to a higher electric bill. If you’re one of those people who are neglecting the sorry condition of your old windows, it might feel like you’re stuck between a rock and a hard place. 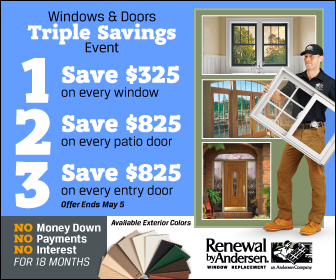 Fortunately, the leading Chesterfield Missouri Windows Company, Renewal by Andersen® of St. Louis has this amazing offer that is impossible to pass up. This is offered for a limited time only! So, you’d better be checking out this opportunity! Renewal by Andersen of St. Louis offers this solution to your window woes. If you’ve been having trouble replacing your windows because of the costs, this special offer is your chance to finally install beautiful, durable replacement windows in Chesterfield MO with NO MONEY DOWN and NO INTEREST for 48 months. And to make it even easier for you to decide, when you buy 4 windows you get the 5th one for FREE! We mean it when we say this is an offer that is too good to pass up because what you will be getting windows made from durable Fibrex® material and High-Performance™ Low-E4® glass to give you style, durability, and energy-efficiency. On top of that, we will install your replacement windows using our dependable installation process. Don’t put up with those old windows any longer! Avail of our special offer today until August 24. You can call now or fill out an online request form to take advantage of this bargain from Renewal by Andersen of St. Louis.